Climate diversities, ancient history, hospitable people and diversity of races make Persia a fantastic and unique tourist destination. In Glories of Persia, we will visit a collection of beauties of the 5760m high Damavand Mountain, the Golestan national park with various species of wild animals and an almost Siberian forests and cities such as Sary, Ramsar, Bandar Anzali, Sarein and Tabriz. 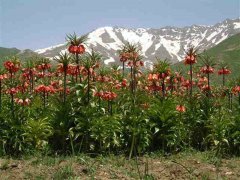 You will visit the highest mountains, the deepest sees and the densest forests of Iran in this unique trip. Go on a discovery! After a short break, we are going to have a luxurious dinner in the Milad Tower, the 6th highest TV tower in the world, with a height of 435m. The tower weighs approximately 150000 tons; the largest diameter of the round hall is 280 m high. The Milad complex includes a convention center, Milad tower, a hotel and the international business center. The revolving restaurant of the Milad tower in Teheran is the biggest revolving restaurant in the world, and turns once around its axis in one hour. In this way it becomes possible for the traveler to have a look at the whole Teheran in their comfortable place. Stay overnight in Tehran. In the morning we will leave Teheran to Rineh. We will drive via Polour. In route (between Polour and Rineh) we will have a stop to visit the beautiful poppy flowers which bloom from the early June to early July and enjoy the marvelous nature, the relaxed atmosphere and the sound of the bees. We continue our trip to Rineh. Rineh is located on the height of 2080 m and is used as a resting place for the mountain hikers. It is also known as “The first camp”. 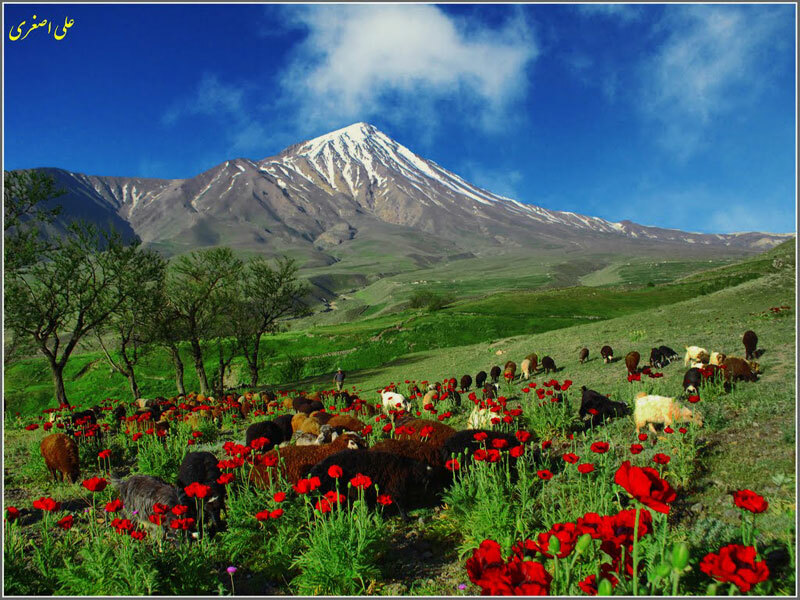 After our arrival in Rineh, we have a bit time to rest and we can form our first impression of the Damavand’s nature. 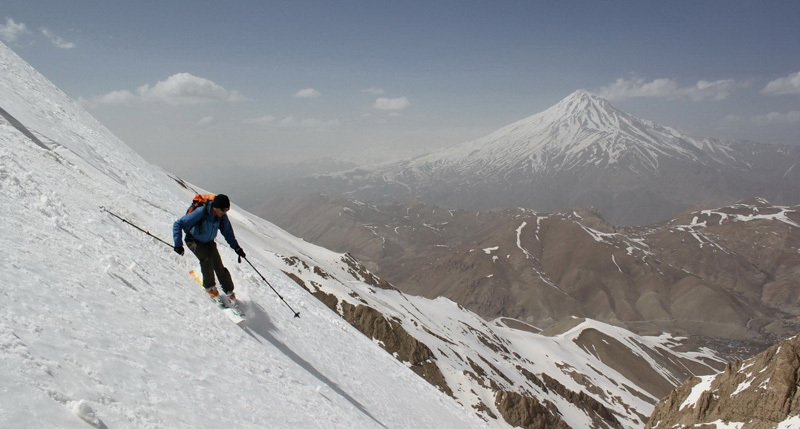 The Damavand, in a height of 5671 m, is in the central part of the Alborz Mountains & south of the Caspian Sea. Damavand is a stratified volcanic Mount & volcanic activity of the mountain is now limited to the sublimation of sulfur gases. There is also a frozen waterfall on the south side of Mount Damavand, which is unique in the world. Its Height is 7 m and a diameter of 3 meters which the ice never melts. This ice waterfall is located on an altitude of 5100 meters height and according to the height of sea level. It is the highest waterfall in the world. After a rest, we will visit the Larijan hot water spring in Rineh. There are lots of different hot water springs in Damavand. The temperature of the Larijan spring is 65-70 °C and 1000 liter water flows in each minute out. After our visit, we will walk back to Rineh. Stay overnight in Rineh. Today we will drive 1h on a rough route by 4×4 to Gousfandsara which is also called “The second camp”. The view of the Damavand Mountain with the golden mosque’s dome in front of it is gorgeous. 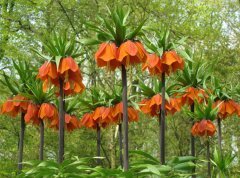 After a short break, we will walk to have a look at the beautiful freshly bloomed fritillaria flowers (7km). 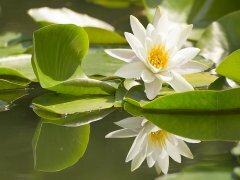 (The bloom of the flowers depends on your travel date) We will rest there and enjoy the beautiful scenery. After that, we will walk back to Gousfand Sara. Then we will drive back to Rineh. Stay overnight in Rineh. We will drive to Golestan national park early in the morning. The Golestan National Park is the first Iranian National Park that is situated in the jurisdiction of Golestan, Semnan and Khorassan provinces. This park because of its natural values like verdant and virgin forest and different species of flora and fauna is one of the famous areas in Iran and the world. Iran has several noteworthy national parks, and Golestan national Park is probably one of the largest. Situated in the highlands of the Caspian region and the steppes of Khorasan province of Northern Iran, the Golestan offers a wide spectrum of flora and fauna. Its fauna consists of 69 mammals, 150 birds, 2 amphibians and 24 Reptile. 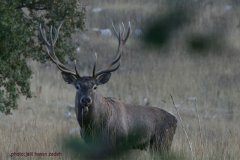 The large animals are Persian Leopard, Brown bear, jackal, Persian ibex, wolves, wild cat, Caspian Red deer, wild boar, gazelle, mountain goat, fox and coyote. The flora comprises 1365 plants, species including several endemic one such as Alma saffron, Persian Ironwood. Golestan National Park with 92,000 hectares area is a dry woodland ecosystem. 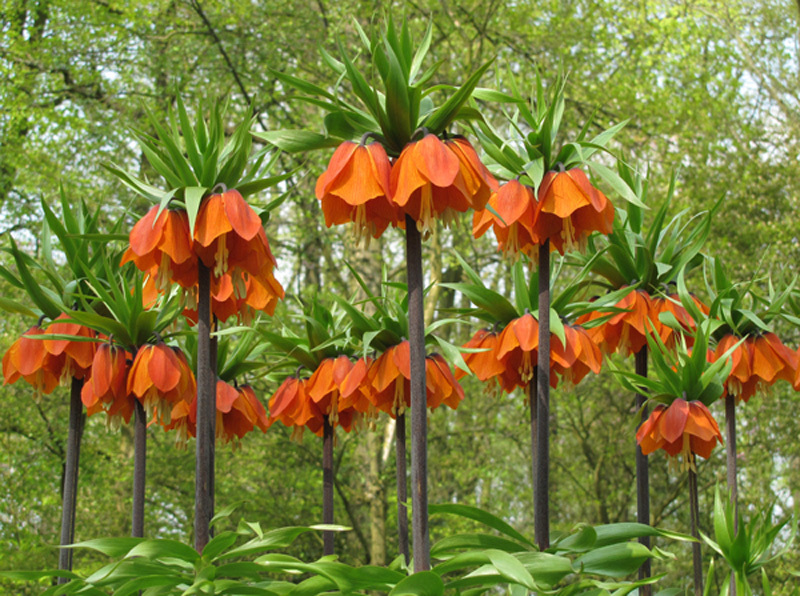 The flora contains 1365 plants, among them endemic sorts, like Alma saffron, and the Persian iron wood. The beauty of the Golestan National Park is due to the variety of nature featured, a total of wildlife habitats, deserts, steppes, lush greenery, riverine, steep rocky cliffs, hills, undulating terrain and marsh habitats. After a short rest, our 2 day Eco Safari tour commences in the national park. The off-road adventure includes day tours, exciting impressions and joy. 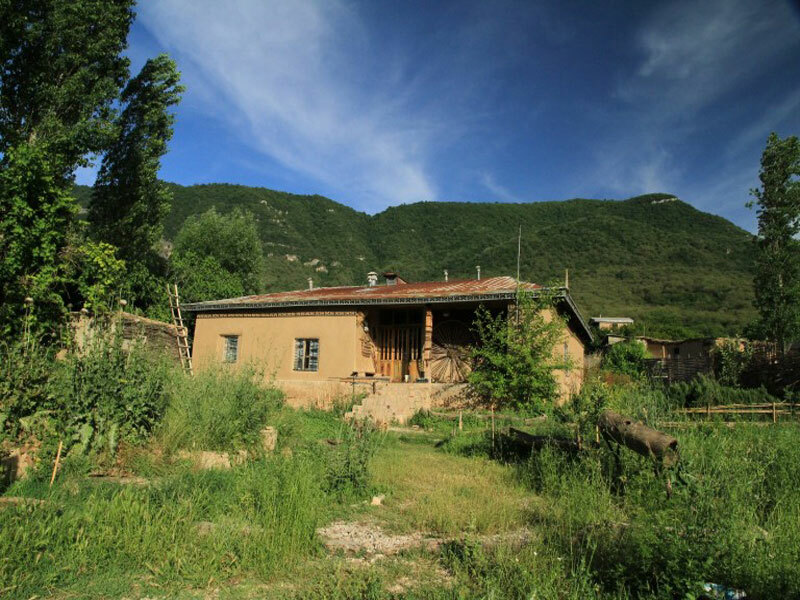 Stay overnight in the Turkmen ecolodge. Our safari continues. We will be taken to some most breathtaking Hotspots by 4×4. 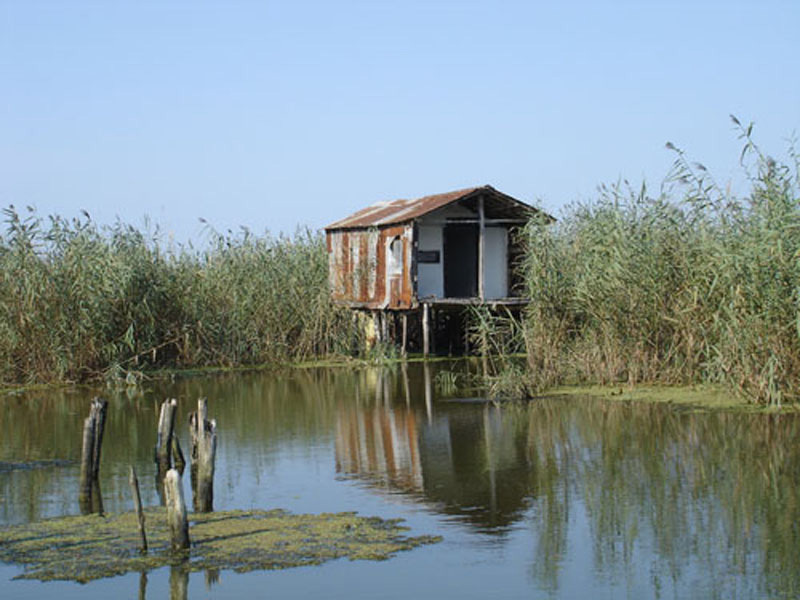 We discover isolated areas, where just few people have the opportunity to visit them. Your memories and photos are timeless reminders of your greatest adventure in the Golestan national park. Stay overnight in the Turkmen ecolodge. Early in the morning, we will leave the Golestan national park. We will drive to Sary via Gorgan. Enjoy the wonderful route. At the beginning of the way, near the national park,there is a waterfall named “Luh”, near a green forest. We have a little time for visiting Sary and we will also have a visit to the interesting “Badab Surt” springs. Stay overnight in Sary. Today we will drive to Ramsar. Ramsar is a small thin coastal city in north of Iran beside the Caspian Sea which has the mountain neighboring it. The image of mountain and the sea, and lying in SPA have astonished many people. Ramsar has a village which is called Javaher Deh (jewel village). This dream village is a masterpiece of nature and surrounded by mountains in three directions with full of forests. 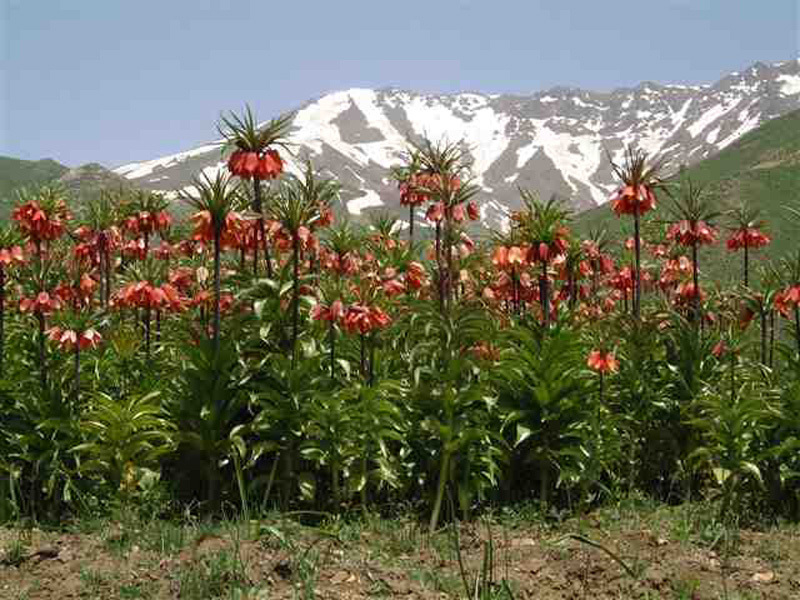 Then we will visit Markouh with cone- shaped peak which is isolated from the Alborz mountain range. We can also use the famous chairlifts in Ramsar which passes the amazing forest. Next, we will visit Khazar museum. This museum is located in the Royal Palace of Ramsar Grand Hotel. In addition to visiting the objects of this museum, you can visit its building. Stay overnight in Ramsar. In the morning, we will drive to Fouman to visit Roudkhan castle. It is for Sassanid period. This castle is near a river with a fantastic nature. The heritage value of the building with the number 1549 has been in the National Register. This castle has many stairs, so it is called hezar peleh(thousand stairs), too. Next, we will visit the historical village of Masooleh. Its architecture is one of the inquests in the world which is registered in UNESCO. Masooleh architecture is unique. The buildings have been built into the mountain and are interconnected. Courtyards and roofs both serve as pedestrian areas similar to streets. Masooleh does not allow any motor vehicles to enter, due to its unique layout. It is the only village in Iran with such a prohibition. However, the small streets and many stairs simply also wouldn't make it possible for vehicles to enter. Yellow clay coats the exterior of most buildings in Masooleh. This allows for better visibility in the fog. Then we will drive to Bandar Anzali. Stay overnight in Bandar Anzali. After that we will drive to Bandar Anzali. After a short rest, we will have a city tour in Bandar Anzali. We will visit clock tower with 28 meters height, Anzali palace where is Navy Military Museum and Ghazian bridge. Stay overnight in Bandar Anzali. 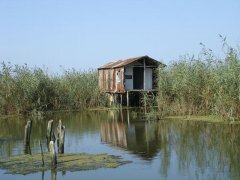 In the morning, we will visit Anzali lagoon which is one of the biggest & most interesting lagoons in the world. This lagoon is full of water lily, everglade and sea tulips. Boat riding across the lagoon is one of the most fun moments of the trip to Bandar-e Anzali. We will visit also Anzali Hafezieh which is used for small exhibition of painting & handy crafts now. Stay overnight in Bandar Anzali. In the morning we will fly to Ardebil. Then we will drive to Sareyn. Sar ‘Eyn, or Sarein is a city in and capital of Sareyn County in Ardabil Province, Iran. Sareyn is known for its hot springs. Many tourists go there due to the charming climate. The Sareyn springs are near an inactive volcano in mount Sabalan and its water contains sulphur particles and it is believed that it is good for bone and joint pains. The climate and hot springs are the first attractions to tourists who travel to this region from different parts of Iran and the world. Hot springs (spa) have always been in Sareyn, and the water is heated largely by the Sabalan Mountain which is Iran's second highest mountain after Damavand. Stay overnight in Sareyn. Today, we will drive to Tabriz, the capital of east-Azerbayjan. About two million people live in this modern city. Tabriz is known particularly for its carpets. The weavers are sitting directly behind the Bazaar, of which their carpets have been sending all over the world. Tabriz lies on the Silk Road, one of the oldest trade routes between Orient and Okzident. Azerbaijan is home to one of the most cultured and bravest races in Iran, the Azaris. You will be impressed by the profundity and richness of Azeri culture, language, music, dance, and literature. Lots of sightseeings here catches the eyes of visitors such as the former Shah Goli or the present Eil Goli (the Shah's pool) which is the name of a large park in Tabriz. It seems that it was used as a water resource for agricultural purposes. It was used as a summer palace during the Qadjar dynasty (when Tabriz was the official residence of Prince of Iran). Then we’ll visit the exotic bazaar which is one of the oldest bazars of the Middle East and the largest covered traditional bazaar in the world. It was inscribed as World Heritage Site by UNESCO in July 2010. Next place is Kabood Mosques the remains of a Great Mosque Kabood or Jahanshah Mosque is one of the works by Abul Mozaffar Jahanshah bin Qara Yousef, a member of Qaraqoyounlu tribe, in Tabriz. It was completed in 870 AH subsequent to supervision of Jahanshah’s wife, Jan Beigum Khatoon. Then we’ll visit holy Serkis church. This church was constructed by 'Petrossian' in the Banvan neighborhood of Tabriz in the year 1821 AD. Stay overnight in Tabriz. In the morning, we’ll visit holy Serkis church, this church was constructed by 'Petrossian' in the Banvan neighborhood of Tabriz in the year 1821 AD. Some people claim that the Eden garden lays here, in the province Azerbaijan in the northwestern part of Iran, in the small area, Kandovan. The cone shaped peeks formed by tufa stones, were built due to erosion, in a height of 3700 m in Zagros Mountains. It is known that in the 13th Century, when the Mongolians enquired Persia, settler took place in this village. Mountain farmers, dug holes in the mountains, which they completed with mud walls, to make it possible to live in them. But it’s not shore whether people lived in this caves, in previous times or not. The rocks look from the distance, like beehives. Bees exist here indeed; the Kandovan’s honey must be very good. 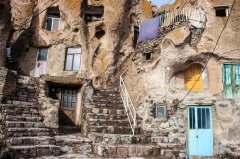 Kando means hive and this is why this tuff stone village is named Kandovan. The people in Kandovan are isolated. Whoever walks among the tiny and steep alleys, can see children and animals. here donkeys are the most important mode of transport, because the routes are sharp and rocky. Especially in the morning, we can see the sheep and goats walking in the streets. many of the inhabitants still make a living from agriculture and sheepcote, like the past. In addition, many people wave carpets which they sell in the nearby city Tabriz. Approximately thousand people live in Kandovan, so that all of the people know each other. Osrai is the language spoken in this village, but Persian is the language teaches in the schools, the Iran’s official language. Many of this rock houses open in an inner-yard which has a big and a small room, in which the animals were kept in the past. Nowadays it is mostly used as a bedroom.They rarely need a furniture. The family members and the guests sit on the floor. Here is the place where they eat, drink and speak with each other. Something amazing, are the small niches which are built inside the rocks. The houses are well isolated, pleasantly cool in summers and warm in the winters. Many of the people drive to the mountains and the small places nearby at the weekend, such as Kandovan. It attracts many travelers who want to stay there for a long time, especially in summer. to appeal more tourists they have constructed a Hotel - (the hotel is also built in rocks), because sleeping in a cave is totally a new experirence, and attracts lots of tourists from near and far. 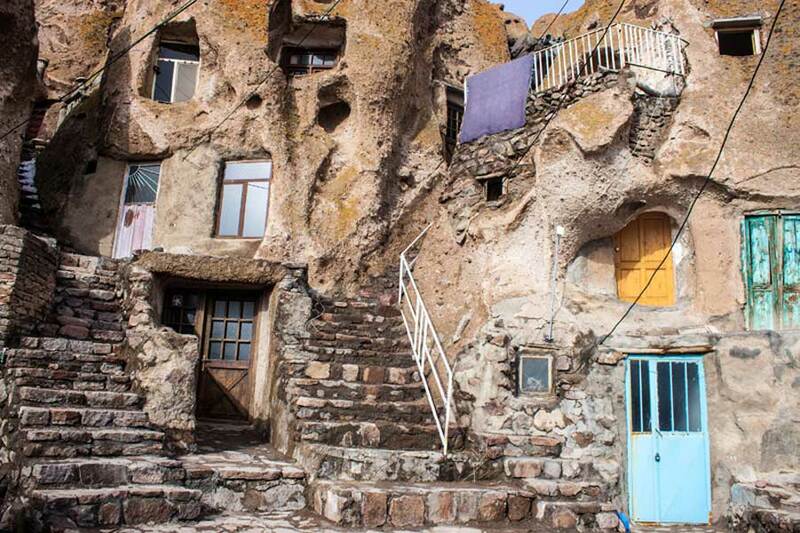 Stay overnight in the Kandovan rocky village. We enjoy the beautiful nature in Kandovan a bit more and then we will drive to Tabriz in the afternoon. After a short city tour, we will be transferred to the Tabriz airport. From there we will fly to Teheran. We will arrival in Teheran in the late evening. Based on your flight program, you will be either transferred directly to the IKA or stay one night in Teheran.